A decision will be taken this week on whether a "lifeline" service for hundreds of armed forces veterans will be forced to close its Grampian base, BBC Scotland understands. Eight Veterans First Point centres were set up in Scotland using cash from the UK government's Libor fund. But that money is running out and local health boards are now covering costs - with help from the Scottish government. It is understood a closure plan has been drawn up for the Aberdeen centre. The centres were set up from money raised by fines paid out by banks involved in the Libor scandal, after they were found to have altered inter-bank lending rates. The eight centres are in Edinburgh (Lothian), Aberdeen (Grampian), Wishaw (Lanarkshire), Dundee (Tayside), Inverness (Highland), Irvine (Ayrshire and Arran), Galashiels (Borders), and Cardenden (Fife). 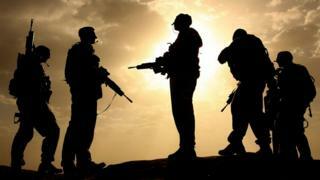 Veterans have previously told BBC Scotland the service acts a "lifeline" for them, offering essential support. Both NHS Grampian and NHS Highland have said they cannot provide funding. It is understood a closure plan has been presented to NHS Grampian by the service warning of a "difficult transition" time for veterans. About 50 former servicemen and woman are being supported in the area - with another 30 on a waiting list. North East Labour MSP Lewis MacDonald has written to Veterans Minister Keith Brown. He said: "When Parliament goes back we certainly want to hear from Keith Brown, the veterans minister in Scotland, about what's he's going to do, because he has some serious questions to answer. "So I'll certainly be tabling questions, and looking for other opportunities to hold the government to account for ensuring that this very valuable service for our veterans continues into the long-term future." Aberdeen South Conservative MP Ross Thomson insisted it was the Scottish government's responsibility to solve the funding issue. He said: "This is an issue that's devolved but I'll be lobbying UK ministers as well. But the Scottish government is responsible for health, for mental health and for veterans and that's why they should be doing something about it." In a statement, NHS Grampian said: "We are extremely proud of our local veterans and through our mainstream services provide a wide range of support to the meet the needs of people who have served in the armed forces. "Whilst we are not in a position to continue to fund the Veterans First Point Service as established, we are keen to explore alternative provision of this locally through working with other veterans programmes and our existing services." The Scottish government said it was actively working with Veterans First Point (V1P) and NHS Boards to "explore future sustainability plans" for the centres. A spokeswoman said: "The Veterans First Point network was established with UK government Libor funding, which is now ending with the agreement that they would become self-sustaining. "We have already provided interim funding to some boards to support this valuable service. "It is disappointing that the Scottish government's match-funding offer for Grampian's Veterans First Point service has not been accepted. "Scottish ministers are considering this position and have asked for reassurances on how veterans will continue to be supported." She added: "We remain committed to ensuring that all veterans living in Scotland experience no disadvantage and are able to access the best possible care and support available." Veterans Minister Keith Brown later said an offer was made to health boards in Grampian and Highland, who had decided to go forward in a different way, but that the Scottish government would continue to work with them. A statement from NHS Highland said: "NHS Highland agreed to take part in the project in order to explore alternative models of service provision to veterans. "It was our understanding that during the life of the project we would contribute to the evidence base and that this would support us in service design in the future. "From the outset, NHS Highland advised that it would not be able to provide a partnership funding commitment to V1P Highland. "The project has strengthened the links between NHS Highland and Poppyscotland and our current focus is to identify key learning in order to continue to develop future services in line with our duties under the Armed Forces Covenant. "Given the positive start to such a new service we would be keen to explore any future options for alternative funding to continue to further develop and deliver V1P."